The Future of Sensors in One Simple Chart (TL;DR: The Future = A Lot of Sensors!) 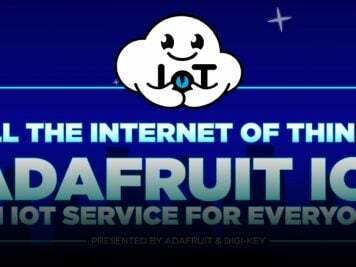 | via @Arrow_Dot_com #IoT #IoTuesday « Adafruit Industries – Makers, hackers, artists, designers and engineers! Arrow have published a “Where to from Here?” regarding the sensors market and the numbers are…well “big” doesn’t even begin to describe the projected impact sensors will have on our lives (and on markets). Arrow’s report details numbers from 2015-2021 (three years back, three years forward) with an average growth in eight market sectors of 11.84%. Either that number seems low, or sensor suppliers are bullish about their own futures, given this PR Newswire post from the end of last year projects an 18.4% compound annual growth rate from last year through 2023 (two additional years out). Interestingly, according to Arrow, image sensor technology is projected to grow at the same rate as magnetic sensor tech – given the ubiquity of image sensors in our lives it’s neat to think of the magnetic sensor industry growing internally at the same rate. Gas sensor technology is also projected to grow at a faster clip than image sensors, with MEMS & SAW (related) both projected to either grow at the largest pace or maintain the largest market size potential. 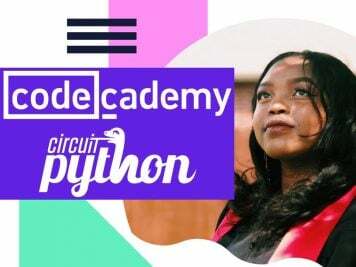 Essentially that means ever smaller, embedded sensors performing or at least initiating activities in our daily lives – from digital media consumption to transportation and even our physical bodies (via the health industry). The next few years alone have the potential to reshape us and our world like never before – via sensors. The sensor world has seen an unprecedented growth explosion in the past few years and there are no signs indicating that the growth will slow down in the near term. Not surprisingly, the growth is fueled by many digital trends including the Internet of Things, consumer products, autonomous systems, etc. The growth is also being accelerated due to dramatic reductions in ASP of sensors which has hastened the use of sensors in all things digital. The sensor world has seen an unprecedented growth explosion in the past few years and there are no signs indicating that the growth will slow down in the near term. Not surprisingly, the growth is fueled by many digital trends including the Internet of Things, consumer products, autonomous systems, etc. The growth is also being accelerated due to dramatic reductions in ASP of sensors which has hastened the use of sensors in all things digital. Looking over the horizon, analysts see several factors as critical drivers of the sensor market. 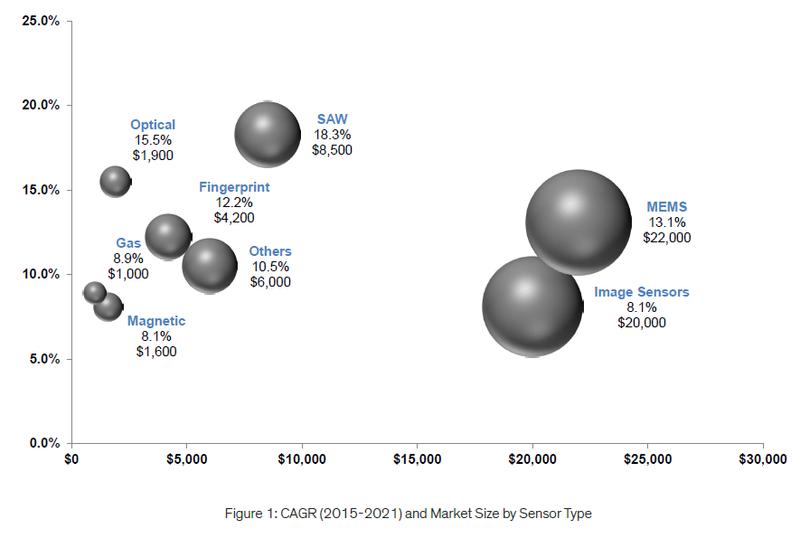 Growth forecasts (CAGR: 2015 to 2021) for the key sensor types are summarized in the figure below.